Featured in Plant Services Magazine. reventative maintenance, tune ups and performance checks—rightly so. 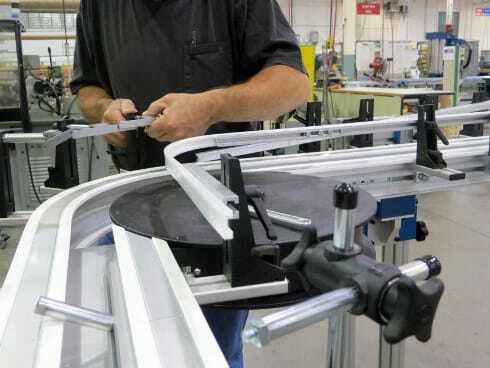 Yet it’s your conveyor framework that moves parts from one expensive machine to the next. No matter how great your really expensive equipment is performing, it won’t matter one bit if you have a conveyor out of commission. While conveyors are one of the foundational pieces to your company’s production infrastructure, they are all too often viewed as a part of the scenery due to their humble nature. It’s not until there’s a conveyor down that they suddenly draw attention. Failure to maintain a conveyor system is the #1 leading cause for their eventual failure. When a conveyor is down, the entire production line goes down. When this happens, the loss of time, worker productivity and profits due to downtime add up quickly. Factor in costly repair efforts and you’ll likely be scratching your head wondering why conveyor maintenance wasn’t a higher priority. Predictive Maintenance is similar to Preventative Maintenance, but think of it as being more refined. Preventative maintenance is structured around the life expectancy of the various conveyor parts such as: belts, bearings, gear motors, etc. The life expectancy for these parts determines their maintenance and replacement schedule—not a bad method, but not necessarily the most cost effective model either. Replacing parts that are in good condition simply because they’ve outlived their suggested life expectancy doesn’t make good business sense. Predictive maintenance requires assessment of parts as well, but builds the maintenance schedule around the actual performance of the various conveyor components, and replacing parts only when they are ready to be replaced. This is where a trained maintenance team that is able to evaluate conveyor systems comes in. 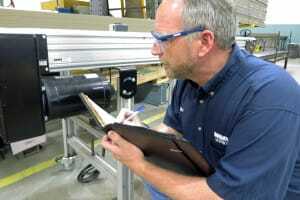 Predictive maintenance is really not all that different from the preventative model—both require that regular attention be paid to conveyors by maintenance personnel. Both build maintenance schedules around the needs of the conveyors themselves. However, predictive does require that the maintenance staff be better trained in order to effectively employ this model. Conveyors don’t usually get the attention they deserve until there’s a problem. Simply paying attention to them can extend their service life. This has to be a team effort—the employees working with them every day are just as important as the maintenance team. Emphasizing awareness and training staff how to identify that there may be a problem, is one of the key elements of the predictive maintenance model. How often a complete conveyor maintenance evaluation is performed really depends upon the volume of production. 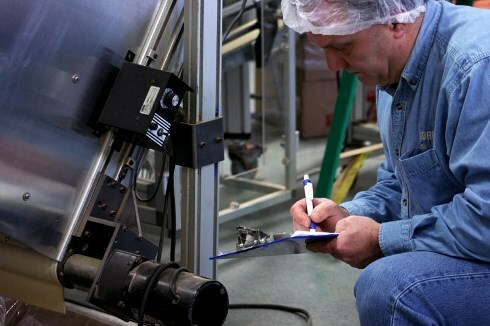 If the workload is light, conveyors only need to be evaluated one or two times a year. 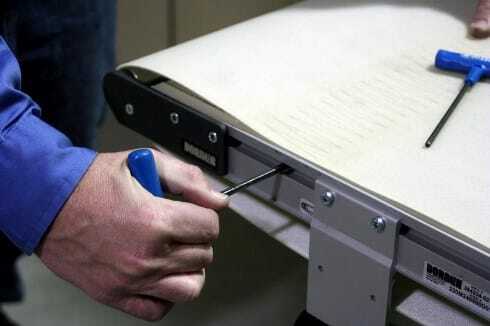 If the workload is heavy, like in a 24/7 shop, then maintenance evaluations need to be conducted at least four to six times a year. Every other month is the safest bet. All machines eventually break down, especially the older they get. Keeping spare parts for your conveyors is integral to minimizing downtime. 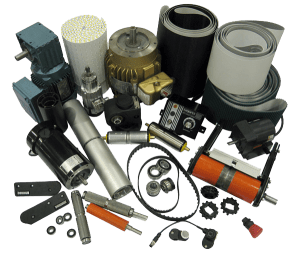 Often times, conveyor producers have recommended spare parts kits specific to each model, whether it be a custom conveyor or not. Keeping at least one or two spare parts for each of the main conveyor components is the safest route. This should include an emphasis on regular evaluation and maintenance. Regardless of whether a company operates with a predictive or preventative maintenance model, this fact doesn’t change. Ideally, training should include more than one on-staff employee, for the simple fact that a conveyor can go down anytime—more than one person with proper training ensures that an expert will always be available. A reputable conveyor manufacturer can provide an audit, including training your staff to effectively coordinate and implement a predictive maintenance model. They can even send their own specialists out on-site for expert evaluations. Since 2011, Steve Stuff has been the Director – Parts & Service / Web Applications for Dorner Mfg. Steve has also held the titles of director of sales support, manager of marketing and international sales, and international sales manager during his 29 year career at Dorner. He can be reached at 800.397.8664 or steve.stuff@dorner.com.